Why Take the CELTA Course? "Beyond doubt, teacher training has been the highlight of my teaching career." Where in the world has EFL teaching taken you? It’s taken me to different parts of Mexico, e.g. CDMX, Cuernavaca, Veracruz, Acapulco, Zihuatanejo, Saltillo, Playa del Carmen, Mazatlán, Culiacán and also to Bogotá, Colombia. What do you love so much about working in Mexico? In addition to its people, excellent weather and sound academic programs, its delicious food and diverse places are amazing. You can enjoy its beaches, bathing places, landscapes, mountains, ruins, museums, theaters, wide culture, etc. What is your favourite thing to do in your spare time in Riviera Maya? Well, there’s a lot to do. While in Playa del Carmen. I take a tour to famous surrounding places, e.g. Tulum, Akumal (just to mention a couple) or go to aquatic parks to delight in nature, including cenotes, and have fun with ziplines. Do you have any insider tips of nice places to visit or to eat or drink in Riviera Maya? I go to Playacar, a gated community in the heart of the Playa del Carmen with a section open to public. There, I ride my bike, visit Mayan ruins and walk on the beach. There are also a lot of stands, shops or malls to do shopping in Playa del Carmen and plenty of restaurants for all tastes and budgets. What does the CELTA offer that other TEFL certificates do not? 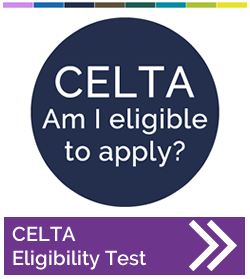 CELTA is the most prestigious initial teaching qualification worldwide. It’s very practical in nature and even though it’s quite demanding, after a month trainees who take it are ready to start their teaching careers in any place of their choice in the world. How would you advise people to prepare for the CELTA? When candidates take courses with the Riviera Maya CELTA centre, upon registration they receive detailed information about the course along with specific pre-tasks that prepare them to successfully get started. ELTcampus also offers an interactive online TEFL preparation course - click here for more information. Do you have any advice for CELTA candidates during the course? Since the workload is heavy, organization is a key feature to bear in mind. Candidates need to plan an effective schedule that will allow them to get enough rest and proper meals while meeting all the requirements, which include deadlines. What made you decide to take the Delta? A professional teacher knows that there’s always room for improvement and new things to learn. Therefore, Delta was only one of the natural steps in my teaching development in a career that has lasted for 27 years. Want to find out more about the Cambridge Delta? Click here for more information. What do you find rewarding about being a teacher? Being able to contribute to improving people’s lives significantly is one of the most rewarding things of being a teacher. Every single learner is unique and allows us not only to share our knowledge with them but also to learn from them, enriching our lives and giving us the opportunity to do a meaningful job. What has been the highlight of your TEFL career so far? Beyond doubt, teacher training has been the highlight of my teaching career. What’s next for your professionally? I also train people to become Spanish teachers (of foreign learners), but the FPELE (curso de formación de profesores de español como lengua extranejera) is not as prestigious as the CELTA. If it were, it would open a lot of doors to Spanish speakers interested in working in other countries, so contributing for this to happen would be great for me. To see the dates and fees for Riviera Maya, please click here. For more information about Riviera Maya in Mexico, click the Lonely Planet guide. 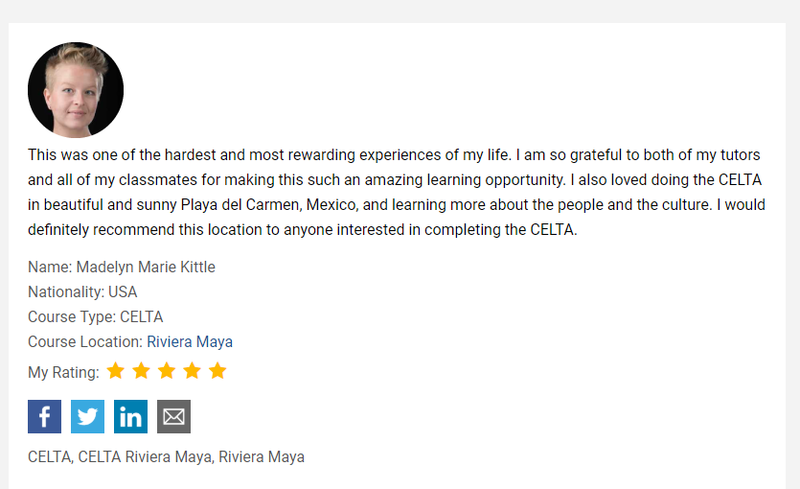 Madelyn loved the CELTA course in Riviera Maya, Mexico... click here to see all our CELTA reviews.